In the best case scenario, Ryan would spend the next two years defending Trump with a smaller majority. In the worst, he'd lose the majority, the speakership and his own House seat. WASHINGTON — It's no wonder that Paul Ryan wanted out. Here's what the Wisconsin Republican walked away from when he announced Wednesday that he wouldn't seek re-election because he wants to spend more time with his teenage kids: President Donald Trump, a brutal midterm election, and trillion-dollar-plus annual deficits that will bind Congress' hands for years to come. House Republicans said it's hard to project what the race to succeed Ryan will look like — a contest that Majority Leader Kevin McCarthy, R-Calif., and Majority Whip Steve Scalise, R-La., have been engaged in behind the scenes for months — precisely because the party's grip on the majority seems so tenuous right now. "If everybody knew who was going to be the majority party in November, we would have very different discussions right now, not only on who is the next speaker but, you know, who is going to be the minority leader," said Rep. Mark Meadows, R-N.C., a Trump ally and the leader of the conservative Freedom Caucus. It's a measure of his success that Ryan, who came into the speakership in 2015 as the consensus choice to calm the chaos of a Republican civil war, was able to focus the House GOP on fighting Democrats instead of one another, moving forward on tax cuts and spending bills, and working productively with an unpredictable president. But it's also true that he was staring into a political future that looked pretty bleak on all fronts, in large part because of voter backlash against Trump and the policy priorities he shared with House Republicans. Most prognosticators believe Democrats will pick up seats in the House in November, and many in the Republican Party fear that the GOP will lose control of the chamber. In the best case scenario, Ryan would spend the next two years defending Trump with a smaller majority. In the worst, he'd lose not only the majority and the speakership but his own House seat. The man who saved House Republicans from themselves was going to have to work very hard just to keep a job that he says he didn't want in the first place — and one that would require him to try to legislate at a time when the national debt is approaching World War II-era levels. Ryan gave "some consideration" to the possibility that his departure could harm House GOP re-election efforts but concluded "I really do not believe, whether I stay or go in 2019, is going to affect a person's individual race for Congress." Some Republicans suggested Ryan's departure will simply be taken by political observers and donors as an indication that Ryan thinks Democrats are bound to take control of the House in November. "His timing now is going to be interpreted as an acknowledgment that the House is lost," said Dan Eberhart, CEO of the oilfield services company Canary and a fundraiser for the GOP. "Donors are going to naturally shift their focus to the Senate." The bigger factor in the midterms, said Rep. Walter Jones, R-N.C., is the man in the Oval Office. "I think the uncertainty in the White House has more to do with the future than Mr. Ryan," said Jones, who has been a frequent critic of Ryan. But, Jones said, voters "should be" concerned about the debt racked up during the Ryan era, which included back-to-back bills slashing taxes and boosting spending on both the military and domestic priorities. "It’s kind of ironic to hear people who talked about being a conservative — and not being critical — but being a conservative how would you spend all this money and you don’t pay for it," Jones said. Others, like retiring Rep. Jeb Hensarling, R-Texas, said Ryan's tax cuts — and the entitlement cuts he championed but wasn't able to enact in his time as speaker — will reverse the flow of red ink. 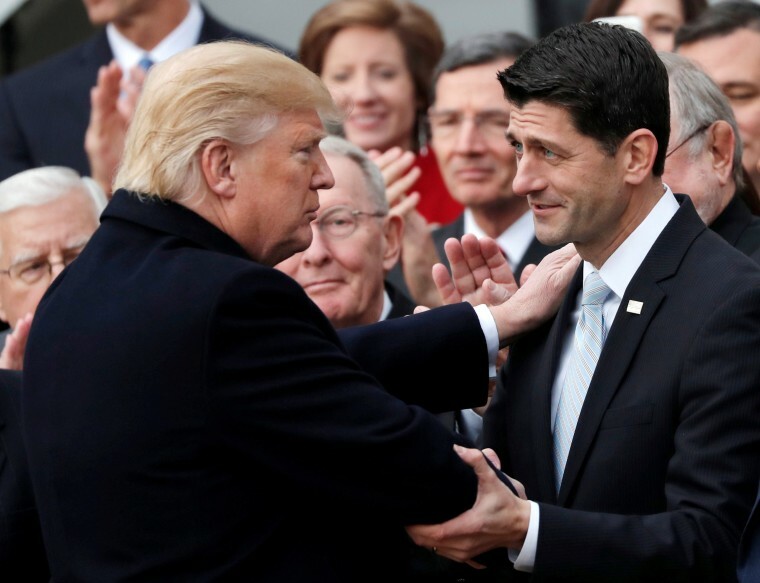 "I believe one day America will be saved from bankruptcy, and when it is it will be because of the ideas and the intellectual foundation of Paul Ryan," Hensarling said. The piece that House Republicans can control in the short term is picking who will fill the vacuum suddenly left by a speaker who had both the institutional power of his office and a personal appeal unique among his colleagues. "Does it create uncertainty here? Yes," Meadows said. "And with that uncertainty comes great opportunity."